Constructs a framework for applying the geometric transformation T to a shape. Use the function Perform to define the shape to transform. 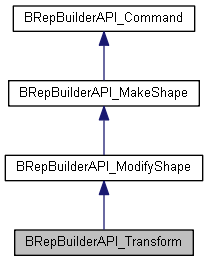 Creates a transformation from the gp_Trsf <T>, and applies it to the shape <S>. If the transformation is direct and isometric (determinant = 1) and <Copy> = Standard_False, the resulting shape is <S> on which a new location has been set. Otherwise, the transformation is applied on a duplication of <S>. pplies the geometric transformation defined at the time of construction of this framework to the shape S.
If the transformation T is direct and isometric, in other words, if the determinant of the vectorial part of T is equal to 1., and if Copy equals false (the default value), the resulting shape is the same as the original but with a new location assigned to it. In all other cases, the transformation is applied to a duplicate of S. Use the function Shape to access the result. Note: this framework can be reused to apply the same geometric transformation to other shapes. You only need to specify them by calling the function Perform again.